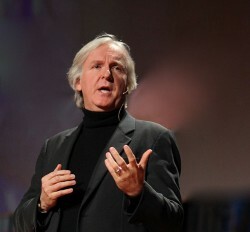 Cornwall ON – Avatar Director James Cameron isn’t happy with the Alberta Tar Sands. The Billionaire fimmaker, pride of Kapuskasing Ontario recently discussed the environment. “I think it’s bad, I think it’s the wrong solution for us to be doing greater and greater environmental damage pursuing a dead-end paradigm, which is fossil fuels, instead of spending those billions … on building wind turbines,” Cameron said Tuesday from his home in Los Angeles. “There’s a danger of coming off as a kind of overnight expert but I have been studying this stuff for a long time, really for 20 years and I’m pretty up to speed on all the issues. I actually think that as an artist and as an activist I’ve got something to say and there’s been a lot of people reaching out to me from various groups around the world to see if there’s something I can do to help them in their causes. Well everyone is entitled to their opinions and it’s always good to see someone who’s benefited so much trying to give back. What do you think Canada? Post your comments below. This is probably the most niaive, shallow comment coming from a Hollywood billionaire I’ve ever heard. So we’re supposed to run our cars on wind turbines? Oil is not used to generate electricity. Wind turbines are not used to run cars. This guy is just spouting off something he heard at a cocktail party. admin, I agree…though Cameron doesn’t appear to have ego problems, if he’s willing to give back, that’s great. Destroying the planet for oil is a zero-sum game. The human imagination is capable of better solutions. That means giving our support to creative people, not quick-fix, short-term-gain privateers and politicians. With respect, M Anderson, cynicism, resignation, and knee-jerk dismissals are not an option. Hear Hear, James Cameron, Richard Komorowski, and PJR!